Last week I was in the clinic and things seemed a little quite. I asked Cindy what was new and exciting. She said that we have a snowy coming in with a broken wing. I responded with a wow and where's it coming in from? She responded "Soldotna". I asked "What the heck was it doing in Soldotna"? That's like a California Condor in Seattle. She said we don't know, but that's where it's coming in from. Sure enough, he arrived in about an hour from Soldotna. He was removed from his travel kennel and immediately examined. He was in perfect health except for a compound fracture to his right midshaft. 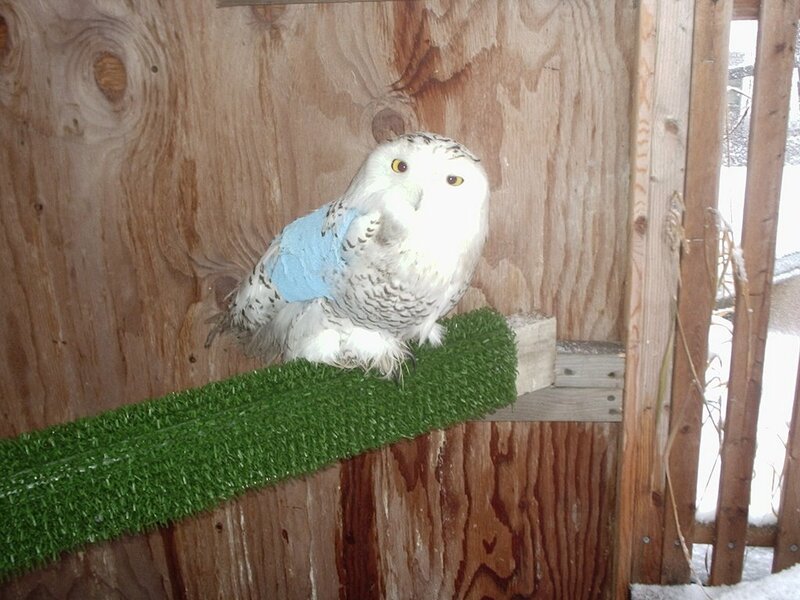 Cindy put him in a wing wrap and gave him an IV to keep him hydrated and trimmed his talons for our protection. 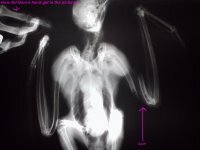 He was scheduled the next day for an x-ray and then surgery if needed. The next day Cindy took him to the Pet Stop for x-ray's. They were then examined by Dr Palmatier who volunteered his lunch hour (plus) for the operation. Stainless steel pin time. The operation went off with only minor hitches. Check out the photo's in the album at right (Photobucket), listed under Snowy Operation 2005. He'll be in a wing wrap for about two weeks. Then he'll get another x-ray and evaluated from there. So far things are looking good. The operation went well and the snowy is acting just fine. He's placed in an outside mew so he'll be more comfortable with the low temperatures and with the little snow we've been getting. He's been eating just fine. If all goes well, he'll have the pin removed in a few weeks. After that it's physical therapy time. As long as he's 100%, he should be released by summer. In the mean time, he's become a Bird TLC celebrity. Snowy's are uncommon this far south, though we have had them in the clinic before. We have one in our education program, but she's base in Niiskki. That's a three hour drive from Anchorage. She does make it to town here, but not too often. Hopefully this fellow is released as soon as possible, but his visit is a treat. This is sort of a repeat story from last week. But I felt I needed to rewrite the story when not rushed.